With the change of seasons upon us and new colors, flavors and scents to explore, it's a fun time to entertain. Hosting a get-together is a great way to experience the delights of the season and spend time with family and friends. Inspired by the orchard harvests, today I'm sharing ideas for a fall cocktail party, complete with two seasonal cocktails that you can recreate for your guests. To get this party started, I set my table with colors of the season. Rich reds and oranges come alive with pops of gold. As you may have noticed, gold and brass have become somewhat trendy again. If you’re a bit unsure about welcoming this trend into your own space, fall is an opportune time to experiment with it, since gold blends beautifully with the warm colors of the season. Today we are focusing on cocktails, but if you’re wondering about food, just serve up your favorites. Dips, snacks and finger foods are perfect for cocktail parties because guests can nibble as much as they like throughout the event. And don’t forget dessert. 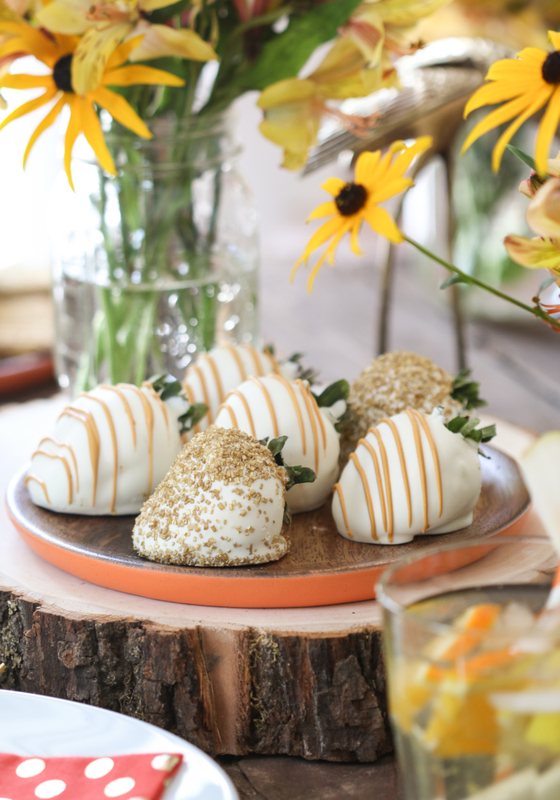 No party is complete without something sweet. For this celebration, I decided to continue the cocktail theme with gorgeous Cocktail Strawberries and Hand-Dipped Champagne Strawberries. The flavors and colors perfectly complement the occasion and other items on my menu. I especially love the flecks of gold on the Champagne Strawberries. With the table set and food prepared, I want to share two cocktail recipes with you. 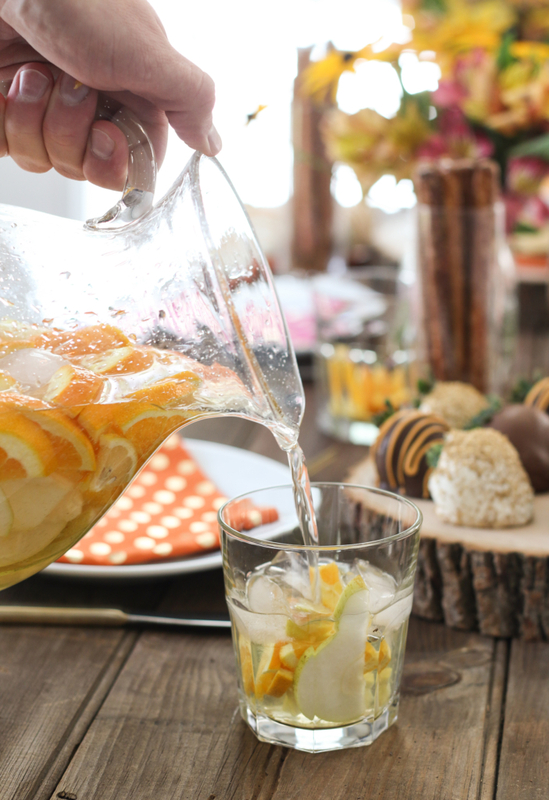 First, a refreshing drink to get the party started: Pear Sangria. Over the years, I’ve found that most people enjoy sangria. It’s a quick and easy cocktail that can be adjusted for the season or the occasion. 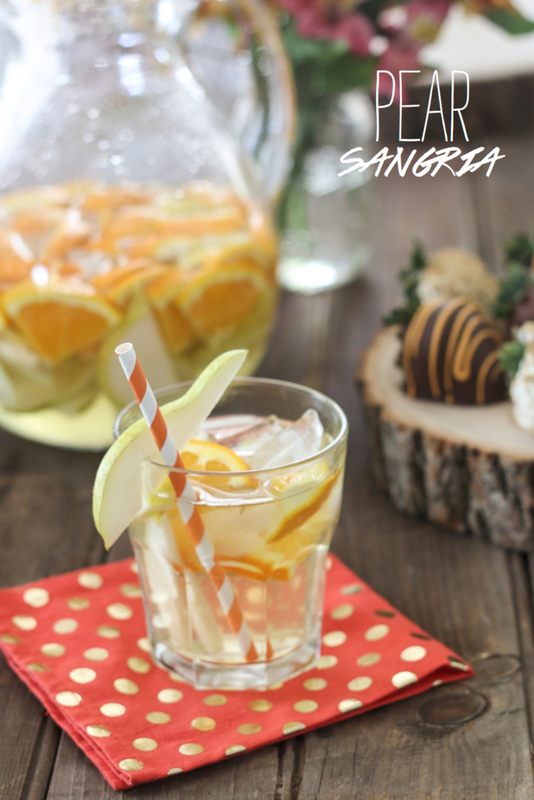 This Pear Sangria is an excellent summer-to-fall-transition drink, crisp yet rich with flavor. Combine all of the ingredients (except for the seltzer water or soda) in a large pitcher. Stir together with a spoon. Let the sangria sit for at least two hours to allow the flavors to meld. Just before serving, add the seltzer water (or soda). Serve over ice. With that cocktail ready to go, I wanted to make up something a little sweeter—a dessert cocktail. 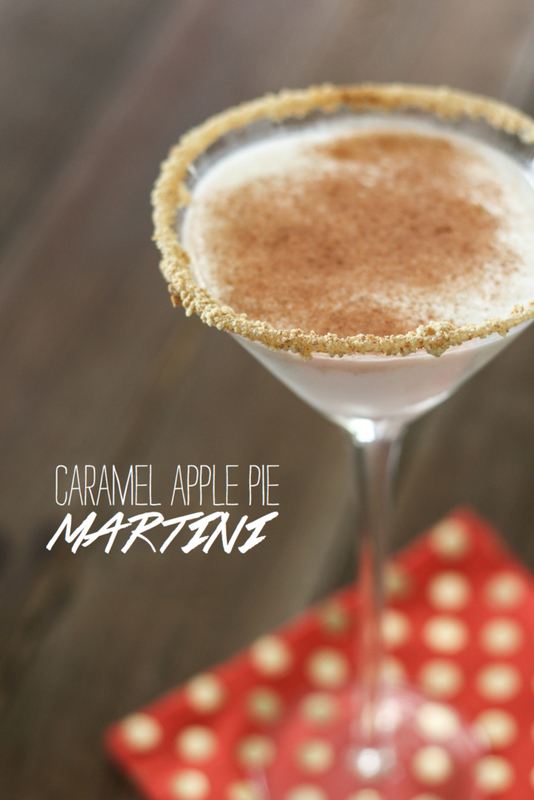 This Caramel Apple Pie Martini is one of my favorites. It reminds me of fresh-baked apple pie with a big dollop of vanilla ice cream. Yummy goodness! 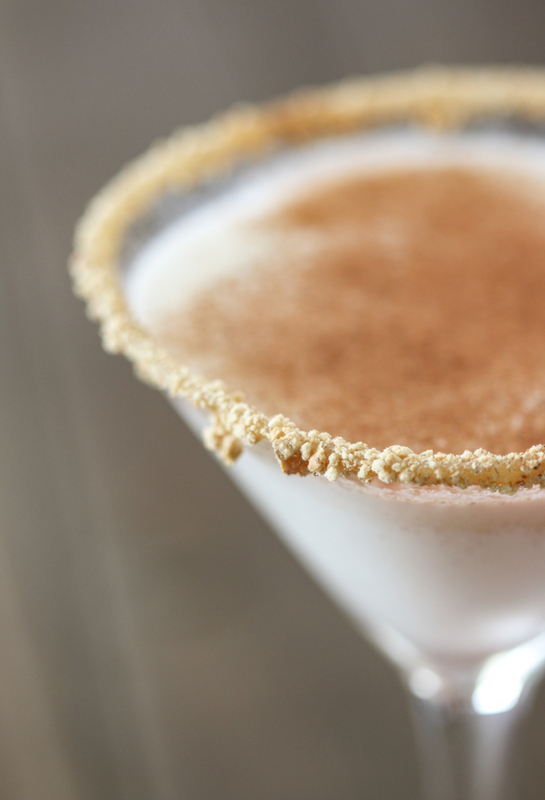 The caramel and graham cracker rim around the edge of the glass is a delightful detail. It provides a delicious flavor and unexpected crunch to this recipe. 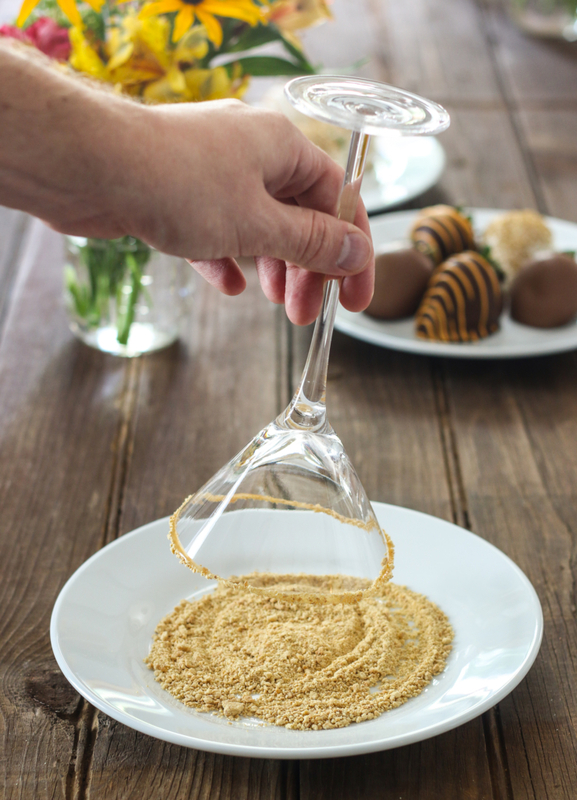 Rim a martini glass with caramel sauce; then dip the glass in crushed graham crackers. Set aside. In a cocktail shaker filled with ice, combine both vodkas, horchata, and half & half. Shake vigorously and pour into prepared martini glass. 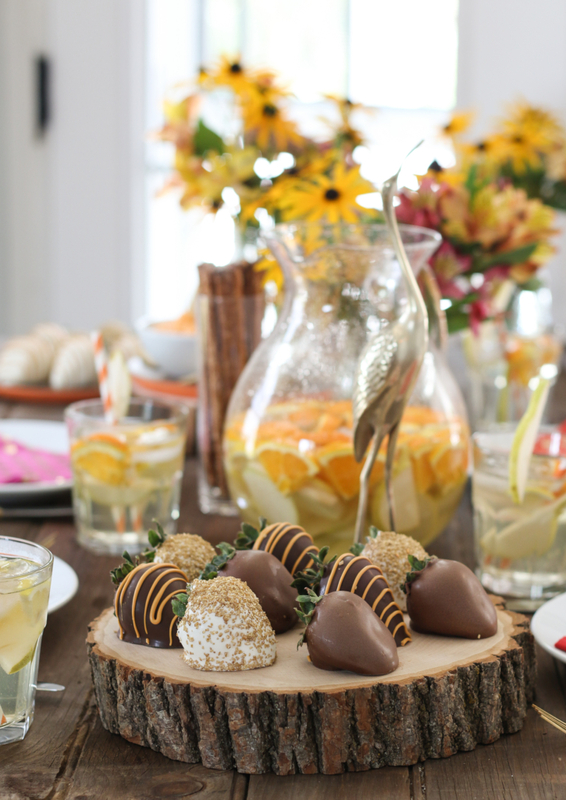 With all of those ingredients in place, you’re ready for a fabulous fall cocktail party. Throw in some flowers (mine were mostly picked from the garden) and some music, and you’re sure to have a fun evening. Oh, and enjoy those strawberries.